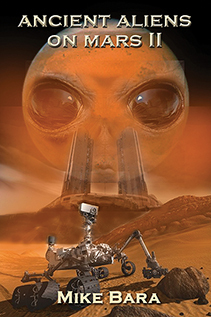 In ANCIENT ALIENS ON MARS II, New York Times bestselling author Mike Bara takes us back to Mars to examine more of the enduring mysteries of the Red Planet. Building on the case made in Ancient Aliens on Mars and using data acquired from sophisticated new scientific instruments, Bara shows that the region of Cydonia overlays a vast underground city full of enormous structures and devices that may still be operating. And that is not the only city on Mars! He peels back the layers of mystery to show images of tunnel systems, temples, bridges and other structures, and exposes the convoluted NASA conspiracy designed to hide them and discredit the researchers who discovered these exotic ruins. Bara also tackles the enigma of Mars’ hollowed out moon Phobos, and exposes evidence from over 30 years of observations that it is artificial. Long-held myths about Mars, including claims that it is protected by an elaborate UFO defense system, are examined and illuminated. Data from the Mars rovers Spirit, Opportunity and Curiosity are examined, as well as data from the European Mars Express. Everything from fossilized plants to mechanical debris is exposed in images taken directly from the space agencies’ own archives. Finally, the author offers his take on the secret history of the Red Planet and what happened to the highly advanced civilization that once flourished there. Now Shipping! Don't wait weeks for this book. Get it now! ANCIENT ALIENS ON MARS II By Mike Bara. 248 Pages. 6x9 Paperback. Illustrated. References. 8-page Color Section.